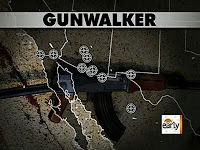 Briefly, Operation Gunwalker is an expansion of an existing Bush-era ATF program which attempted to track guns that ended up in the hands of narco gangs in Mexico. The Obama administration stepped this up to actually putting guns in the hands of these criminals, resulting in literally hundreds - as in more than 200 - deaths, including US police officers, citizens, and federal agents. So far this isn't getting much attention in the news, but its a far more horrific scandal than Watergate, Iran Contra, and Solyndra combined. The Obama administration has been stonewalling investigators and trying to portray this as an isolated state attorney general's actions. Will this gain any traction? Not if the legacy media can help it. Federal agents were literally ordered to not follow the guns up. Why on earth do this? In May 2010, for example, the Mexican government, which has received training from ATF to better identify firearms, said that of the 75,000 firearms it seized in the last three years about 80 percent, or 60,000 firearms, came from the United States. In reality, only around 17% of the guns used in violent crime in Mexico come from the US. Until Operation Fast and Furious/Gunwalker. They shipped more than two thousand guns across the border deliberately to violent drug cartels. Already there were rumors of Gunwalker out, and rapidly the story exploded as frustrated ATF and Justice Department whistleblowers went to congress and the press. After months of pretending that “Fast and Furious” was a botched surveillance operation of illegal gun-running spearheaded by the ATF and the US attorney’s office in Phoenix, it turns out that the government itself was selling guns to the bad guys. Agent John Dodson was ordered to buy four Draco pistols for cash and even got a letter from his supervisor, David Voth, authorizing a federally licensed gun dealer to sell him the guns without bothering about the necessary paperwork. On orders, Dodson then sold the guns to known criminals, who first stashed them away and then -- deliberately unhindered by the ATF or any other agency -- whisked them off to Mexico. The point wasn't to track guns because the agents were told not to do so. The point wasn't to find crooked gun dealers because the agents were working through the dealers. The point wasn't to stop gun violence because the US government was selling guns to crooks. The point wasn't to track down the money trail, because agents were ordered not to do so. This wasn't isolated to one state or one attorney general, and it wasn't even isolated to just Mexican drug cartels. What possible purpose could Operation Gunwalker have had? Connect the dots, because no daring investigative reporter at the Washington Post or New York Times is going to do it for you. They're trying desperately to look the other way.